Veggie fried rice – Put that leftover rice to good use with another Chinese take-out fake-out favorite you can easily make at home. It never fails that when we’re looking to get Chinese take-out, I’m craving fried rice with my meal. Because let’s face it, white rice is for the birds. The sticky stuff does nothing for me. What about you? So when I came across this recipe for veggie fried rice last month, I was all over it like, umm, white on rice? Ha! I loved the fact that by making it at home, I could control the ingredients. I felt the exact same way when I made this orange chicken and this shrimp lo mein. They’re both excellent take-out fake-out meals! I also love that I now have a way to use up leftover rice from other nights of the week. Who’s with me on never knowing what to do with leftover rice in the fridge?? My honey soy garlic chicken stir-fry uses the exact same concept by being a versatile meal to use up leftover veggies in the fridge. Otherwise, I can just simply make the rice on the weekend when I have a few spare minutes in the kitchen to make this a quick weeknight meal. The rice really needs to be cold for it to work well in fried rice rice recipes, so making it ahead is perfect here! I immediately opted for brown rice, increased the amounts of both the fresh garlic and ginger, and used frozen peas and carrots rather than peeling and chopping multiple carrots. Using frozen veggies really cut down on the amount of prep time for this rice – no peeling and chopping carrots! – so I’ll definitely do this again! We seriously loved how this recipe turned out! And we loved it so much so that we made it twice in a week! 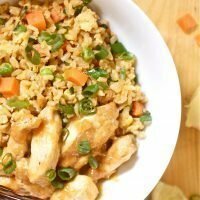 We paired it one night with some teriyaki chicken to round out the meal and it ended up being a substantial, quick, and relatively healthy dinner. I love meals like this!! And since I misread a recipe I made earlier this week, leaving me with over 3 cups of cooked brown rice, I know what we’re having tonight! 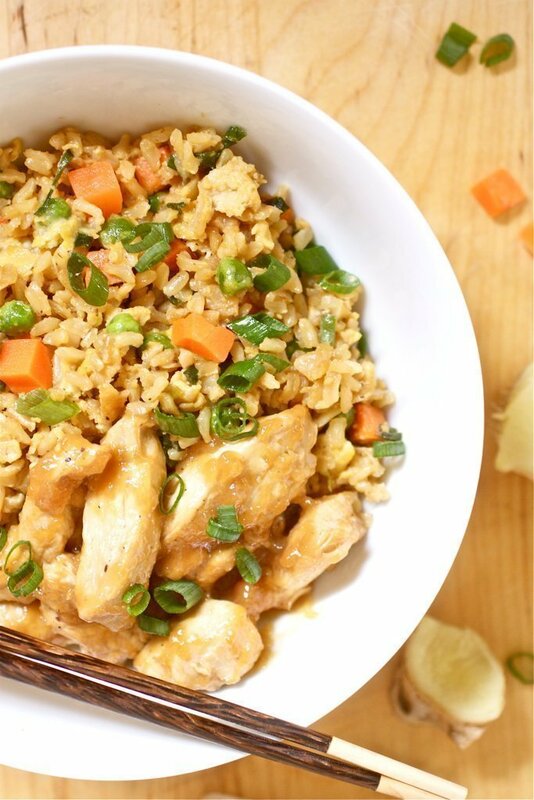 Put that leftover rice to good use with another Chinese take-out fake-out favorite you can easily make at home. 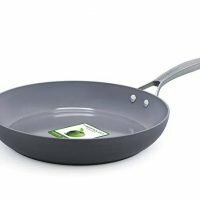 Push the vegetables to the outside edge of the pan and heat 2 tbsp of the oil in the empty center of the pan. Add the eggs and whisk constantly until the eggs are just set then stir the eggs into the vegetables. Stir in the cold rice and using a wooden spoon, break up any clumps. Spread the rice out in the pan and allow it to sit undisturbed for about 2 minutes. Stir the rice again, breaking up any clumps. Add soy and oyster sauces and stir until rice is thoroughly coated. Add the remaining green onions and toss to combine. Adjust seasonings by adding more soy sauce, if needed. Serve hot. Love me some take out fake out! Looks awesome! This is a staple in my house! We love it! This looks absolutely fantastic. That picture makes me want Chinese food so badly! I can’t wait to try this. Frozen peas and carrots = totally genius. Not sure why I didn’t think of that before, but I’m sure glad you did! We’re making this tonight, and I’m definitely going to make it with your adaptations.